One of the great ways to exercise in Chiang Mai is swimming. Most of the year you can swim both in the daytime and in the evening – it is always warm and all the swimming pools I know of are outside. The only time of the year that you may prefer only to swim during the day is the winter (from November to February) when the air temperature may drop to 15 degrees in the evening. Even for a working woman like myself, I still feel as if I am on holiday all year long when I go to my favorite pool twice a week to swim. The picture below feature my favorite swimming pool. Thomas and I swim here together. It is the pool on the 7th floor in the Lotus Hotel in Central Kad Suen Kaew on Huay Kaew road. The swimming pool which is open from 9-21 costs 100 baht to use per time and with that comes a clean towel (not sour like most laundry in the rainy season they must have the only hot water washing machine in Chiang Mai 🙂 ). In the weekends we like to spend time sunbathing here as well and if you hide yourself you can even sunbath without a top (Scandinavian style). Another pool you might want to consider is the Olympic size pool in the 700 Years Stadium. The entrance fee is 50 baht, but you have to remember your own towel and padlock for the safe. Be warned that the showers and toilets are a bit dirty. To get to the stadium you drive north on the Canal road for about 4 kilometers (from Huay Kaew road). It is on your left-hand side. The opening hours are 9-20. A third option is the Duangtawan Hotel (although more expensive). The hotel has a sauna and a big L-shaped pool. The cost for using the pool for one day is 200 baht, but monthly and yearly memberships are also available. 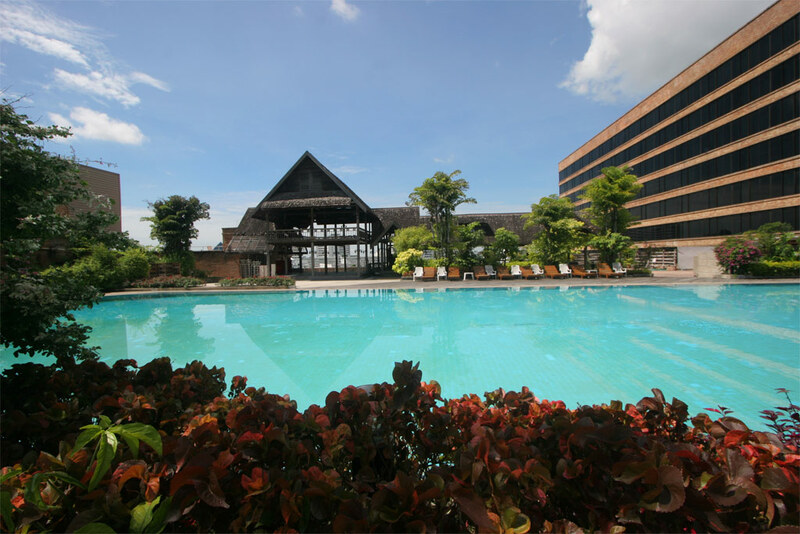 The Duangtawan hotel is located on Loi Kroh road just off the night Bazaar..
Another swimming pool in Chiangmai which is open to tourists is a private swimming club, the Centre of the Universe, which also offers accommodation. Although membership is primarily targeted at locals and expatriates, Temporary One Day membership is available to tourists. Situated off the Canal Road (but much closer to Phucome Hotel than the 700 year stadium) the club has three pools. The main pool is 25 metres x 16 metres and there are two smaller pools for children and toddlers. The pool opens from 0630-1930 daily. From city centre take Huay Kaew Road to Doi Suthep. At Phucome Hotel turn right onto Route 121 signposted Mae Rim and 700 Year Stadium. After traveling past Fine Thanks Restaurant and Diamond Condo look for 2 bridges on the left, that go over the canal. Turn left onto the second bridge and follow signs for Sang Serene House. Turn right at the T junction and look for entrance to Centre of the Universe on the right. For detailed map visit therealcentreoftheuniverse.com or Google “swimming pools chiangmai” which will lead you to this site and other chiangmai swimming pools open to the public. is this swimming pool still open to people who are not staying at the hotel? Yes it is Roxy – it costs 100 THB for non-guests of the hotel. Couple of my friends have told me about a swimming pool which does not require a membership and is very inexpensive. First, I thought that it would be horrible because it only costs 40 Baht with no time limit. However, until we had a get-together on a weekend at the pool, I was stunned. This is such a beautiful pool. It’s very nice and clean. The water is clear and perfect for sunbathing. The owner speaks English. (My Thai isn’t so good.) I vote Lake View Park 2 Club House the best swimming pool in Chiang Mai. It’s only 4 kms from Superhighway. I just can’t explain how to get there. It’s not far from Ruamchoke Market. So, call 053-844-927 for direction. They also have dry sauna, too.